''I grew up with horses farming in Co Limerick, Ireland, and it’s something I’ve always wanted to do. My wife, Katherine, used to work the horse while I did the timber-felling, but she now looks after the house and the farm in the Lake District while I – and four of my sons – do the horse logging. 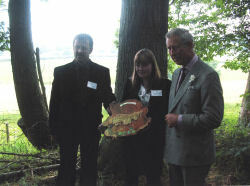 “It remains the most environmentally friendly, low-carbon form of timber harvesting. 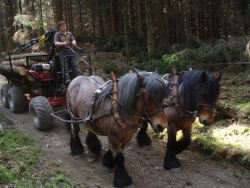 Horse loggers are often asked to work in difficult areas: big machines have their place, but, usually, other big machines then have to come in and repair the damage. “None of us has the right to destroy the forest. We recognise mechanised harvesting will be the main mover, but on sensitive sites of archaeological importance or by rivers and watercourses, horses are best. 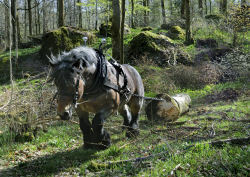 Reasons for choosing horse logging as a means of timber harvesting. ๏ No damage to Rivers / Lakes / Streams. ๏ Selective logging (no roadways). ๏ Sites of special scientific intrest. ๏ No damage to remaining timber crop. ๏ Steep ground / Rough ground. ๏ Taking out windblow trees. ๏ Harvesting on historical sites.